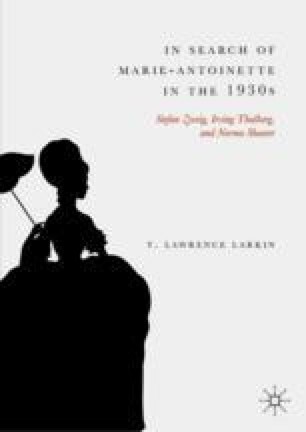 This chapter treats with the origins, research process, and argumentative development of Stefan Zweig’s Marie Antoinette: Bildnis eines mittleren Charakters (Marie Antoinette: The Portrait of an Average Woman) of 1932. It begins by situating Zweig’s biographical output of the late 1920s in relation to contemporaneous trends in psychological biography and French Revolutionary history. It then discusses the author’s dual scenario of a Dauphine’s unfulfilled sexual longings subsumed in extravagant amusements at court and a queen’s belated assumption of official obligations, culminating in self-actualization through suffering and then acceptance of fate during the most radical phase of the Revolution. The essay further considers the contradictions inherent in the author’s determination to avoid a direct statement against the rise of fascism in Germany and forward a message of “inward hope” constitutive of passive acceptance of fate. Finally, it addresses the book’s enormous appeal to the public despite a mixed reception by critics. Editions Bernard Grasset. 1 February 1932. Verlagsverträge zu Übersetzungen von Marie Antoinette, 2 pp. Salzburg: Literaturarchiv. SZ-AAP/L13.1. http://gams.uni-graz.at/o:szd.collection.1. Accessed 15–16, 18–19 August 2018. ———. Early 1930s. Das Hauptbuch aus Stefan Zweigs Büro. A Page from the General Ledger. Salzburg: Literaturarchiv. Hauptbuch SZ-SAM/L1. http://gams.uni-graz.at/o:szd.collection.1. Accessed 15–19 August 2018. ———. Early 1930s. Ein Bogen aus dem Typoskript von Marie Antoinette mit Korrekturen. A Sheet of Typeface with Corrections. Salzburg: Literaturarchiv. Marie Antoinette SZ-SHB/W1. http://gams.uni-graz.at/o:szd.collection.1. Accessed 15–18 August 2018. ———. Early 1930s. Erste Werknotizen zu Marie Antoinette. Unpublished Working Notes. Fredonia: Reed Library, State University of New York. Werknotizen S11, SZ-AP2/W-S11. http://gams.uni-graz.at/o:szd.collection.1. Accessed 15–18 August 2018. ———. Early 1930s. Korrekturfahnen der Erstausgabe von Marie Antoinette. Corrections to the First Edition. Jerusalem: National Library of Israel. ARC. Ms. Var. 305 3 81. http://rosetta.nli.org.il/delivery/DeliveryManagerServlet?dps_pid=IE26224507. Accessed 15–18 August 2018. ———. Early 1930s. Manuskript des Kapitels Geheimnis des Alcovens. Unpublished Manuscript of the Chapter “Secret of the Alcove,” Adolf Haslinger Literaturstiftung. Salzburg: Literaturarchiv. SZ-SAH/W2. http://gams.uni-graz.at/o:szd.collection.1. Accessed 15–18 August 2018. ———. Early 1930s. Skizzen zu Kapiteln von Marie Antoinette. Unpublished Drafts of Chapters “Secret of the Alcove,” “The New Society,” “The Queen Becomes Unpopular,” and “The Last Ride,” Adolf Haslinger Literaturstiftung. Salzburg: Literaturarchiv. SZ-SAM/W1.1. http://gams.uni-graz.at/o:szd.collection.1. Accessed 15–18 August 2018. ———. Early 1930s. Werknotizen zum Kapitel Geheimnis des Alcovens. Unpublished Working Notes on the Chapter “Secret of the Alcove.” Salzburg: Literaturarchiv. Werknotizen 4, SZ-AAP/W42. http://gams.uni-graz.at/o:szd.collection.1. Accessed 15–18 August 2018. ———. 1931. Tagebuch aus dem Jahr 1931. Unpublished Diary. Salzburg: Literaturarchiv. SZ-AAP/L7, n.p., entries for 21, 25, and 27 October, 1, 2, 3, 4, 6, 7, 9, 13, 14, 22, and 25 November 1931. http://gams.uni-graz.at/o:szd.collection.1. Accessed 15–18 August 2018.